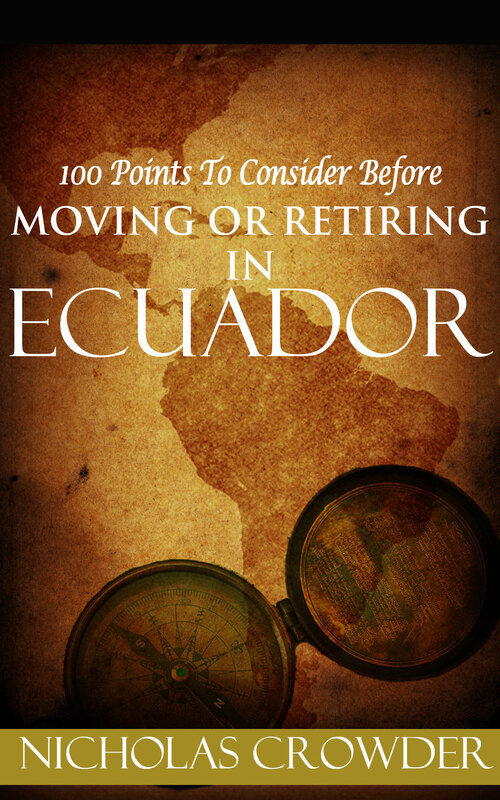 As a long-time resident of Ecuador, I can say with certainty that you won’t find a book like this with profound cultural insights, Do’s and Don’ts, as well as invaluable ‘must-know’ information on what to expect when setting up residence in Ecuador. In this book, Nicholas Crowder draws on his 30-plus years’ years of first-hand experience in Ecuador, marrying into an Ecuadorian family, and dealing with locals and situations on all levels. While many of the “how to” books are written from the personal perspective of one or two people who have lived here in Ecuador for a few years…. Crowder hits us with bulleted fact after fact, replete with colorful anecdotes; this is an easy and entertaining read. Your life in Ecuador may very well depend on it! This book is not a sugar-laden milkshake of feel-good, fuzzy dribble telling you what a paradise Ecuador is for expatriates. For over 32 years author Nicholas Crowder has been intimately involved in a deep study of this intricate and complex country. The author shares his vast knowledge, rare insight and experience of an often misunderstood hierarchical and patriarchal society, that can grind up and spit out an expat before they know it. The information contained in this book will arm potential future expats with valuable inside cultural information that is invaluable for anyone researching Ecuador as a living destination. If you are already an expat in Ecuador, much of the information contained in this book will also enhance your current knowledge of what Mr. Crowder refers to as the “Emerald of the Andes”. 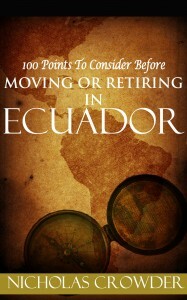 This book will provide you with literally hundreds of nuggets of information that anyone considering moving to or already living in Ecuador will find pertinent. Ecuador is different than anywhere you have been and it is not what it appears to be on the surface. Having a deeper knowledge of the culture will enhance your quality of life in Ecuador. Don’t misunderstand; the author holds a deep love and respect for Ecuador. His purpose is to inform others about the complications of this fascinating country in order to increase the reader’s chances of having a successful experience in Ecuador. This book also provides readers no holds barred interviews with expatriates who have left Ecuador and those who are currently residing there. And, the author also provides relevant inside secrets of living in Ecuador from an infamous and often misunderstood Ecuadorian, “Don Nadie” who tells you the way it is in Ecuador. Thinking of moving to Cuenca? This book will reveal little known information as to why Cuenca is one of the most attractive places for expatriates. To many expatriates the people from Cuenca are known as Cuencanos but, revealed here is another name which is not widely known as to how Cuencanos are known by throughout Ecuador. If you dream of moving to Ecuador to open a business, this book will disclose some of the critical pitfalls of operating an enterprise in Ecuador. If you are visiting Ecuador as a tourist, you will find it full of cultural cues and do’s and don’ts to enhance your travel.